It’s always been tough being a worker in a capitalist system, and raising oneself up out of the state of non-unionized virtual peonage is especially hard: in such situations, one is at the mercy of the employer. The great global financial crisis of 2008 turned many laborers into ever more desperate souls, willing to work under any condition, but the battle between the forces of capital and labor have raged since long before Karl Marx wrote Das Kapital. Three new films take a look at this perpetual conflict – two from the point of view of the laborer and the other from the point of view of the rising capitalist (and former laborer) – in unique and mostly entertaining and intelligent ways. In particular, they analyze how the act of working, itself, can be what lends meaning to our lives: our sense of self-worth is intimately linked to the work we do or the job we hold, or simply the fact that we have a job. From the great fraternal Belgian filmmakers Jean-Pierre and Luc Dardenne (L’enfant) – perpetually interested, it seems, in high-stakes stories about working-class and underclass characters in crisis – comes a new film that is one of the best treatments of the challenges faced by modern-day worker bees that I have seen. 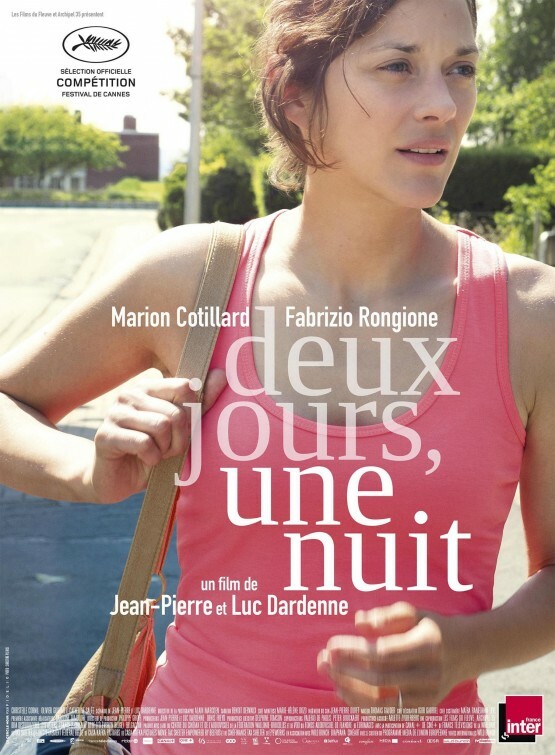 Starring Marion Cotillard (La Vie en Rose), nominated – for this film – for a 2015 Best Actress Oscar, the film is a brilliant portrait of a woman, Sandra, at the end of her rope, thanks to a cruel decision taken by her boss vis-à-vis her employment status. Through her struggle to retain her job – and her dignity as a human being – she discovers previously unknown reserves of strength within herself that compensate – up to a point – for her lost job. As the film begins, Sandra is about to return to work at Solwal, a Solar Panel company from which she has been away – on medical leave – for four months. She has just recovered from a bout of severe clinical depression, but is now healthy (enough). So when she gets a phone call on a Friday from a co-worker, Juliette, informing her that her boss just offered the other Solwal employees a choice between receiving their end-of-term bonuses or keeping her, Sandra, on the payroll, and that the vote (not surprisingly) did not go in her favor, she is (understandably) devastated. As we learn, she and her husband (and two kids) have only recently moved out of social-welfare housing, and the loss of Sandra’s salary will throw them back into their old situation. But Juliette is a woman on a mission, and drags Sandra to meet the boss, convincing him to allow another vote on Monday. This one will be done via secret ballot, and without the foreman present. Sandra therefore has the weekend – the “two days, one night” of the title – to wage a door-to-door campaign to woo her co-workers to vote in her favor. It’s a nasty deal – she is asking people in no better financial situations than her to give up money they feel they’ve earned – and would be hard enough for someone in great mental health. For Sandra, it threatens to undo her recovery. Fortunately, she has an extremely supportive husband, Manu – played wonderfully by Dardenne regular Fabrizio Rongione (Rosetta) – who understands that the only possible way Sandra will become whole again is by fighting for her job (and dignity). Sure, they need her salary, but he, himself, needs her once more present as both mother and wife. Not only are both Cotillard (who spends much of the movie hunched over and physically weighed down by her burdensome task) and Rongione individually spectacular, but they are marvelous together, and completely believable as a long-term couple. It’s them against the system, and though the system may not care, we do. To see at all costs. 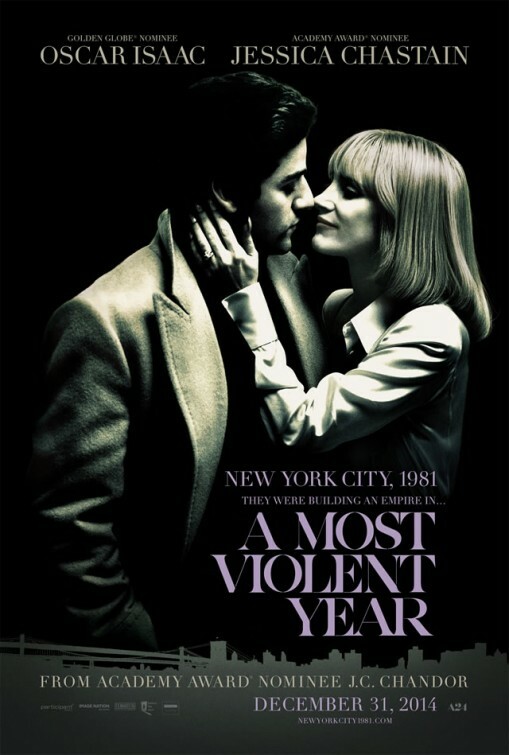 The new film from J.C. Chandor (All Is Lost) is set in New York City in 1981, a time when the Big Apple was rife with crime and decay, and centers on a former truck driver, Abel – played with heart and grit by Oscar Isaac (Inside Llewyn Davis) – who now owns the heating-oil company for which he once worked and has plans to expand his business. Unfortunately, he also has a host of competitors, some of them with mob connections, and an ambitious D.A. – played by David Oyelowo (Selma) – threatening to prosecute him for financial improprieties. Things could either go really well for Abel or really badly. Right at the start, they take the latter course. This is a movie that closely analyzes the politics and opportunities (or lack thereof) for social mobility in late-stage capitalism. As in Chandor’s first film, Margin Call, the director is fascinated by the nitty-gritty details of how institutions operate (in a way, All Is Lost was similar, too, if one substitutes “institution” for “survival”). We spend a lot of time watching Jessica Chastain (Interstellar), as Abel’s Lady Macbeth-like (and mob-connected, herself) wife poring through files (when she’s not taunting Abel on how a real man would respond to threats), looking through accounting errors. Crime may be rampant in the big city, but success in business depends as much on will power as in understanding paperwork. Abel is a wonderful metaphor for what can happen to a person when they pull themselves up by their bootstraps, only to come face to face with the boot makers. He’s good at what he does, but will that be good enough? In sharp contrast to Abel’s mover and shaker is a fellow immigrant (Abel is originally from South America), Julian – touchingly played by Elyes Gabel (Rakharo on “Game of Thrones“) – who doesn’t have the same drive (and wife) as Abel, and so is ripe to be used and discarded when his usefulness has expired (shades of Two Days, One Night). Indeed, if the film is, indeed, an exploration of what it takes to succeed in (American capitalist) business, then it’s the interactions between these two men that the story is told. The movie does have its action scenes (yes, violence comes into play), and also a lot of other, fun performances that add a rich texture to the seedy vibe. Albert Brooks is especially fine as Abel’s lawyer/consigliere, and Alessandro Nivola brings charm and chill to his role as a Mafioso rival to Abel. It is a powerful film about the temptations of corruption, how to avoid them, and the price we pay when we give into them. In spite of some reviews labeling Jude Law as “somewhat miscast” – a statement with which I totally disagree – Jude Law is, in fact, one of the best things about this movie, and he is very, very good. All sinew and tough muscle, hair shorn to stubble, Scottish accent bursting from between clenched teeth, Law is the epitome of the angry blue-collar guy who gets the shaft from white-collar guys who care only about their bottom line. The film opens – after an unnecessary, though visually arresting, title sequence filled with archival footage of subs, Nazis and Stalin – on Law, as Robinson, a submarine captain who works (or soon, worked) for Agora, an international marine-wreck salvage company, receiving his pink slip from a mealy-mouthed (younger, English) executive. He is no longer needed (for reasons never specified) – even though he’s given 11 years of his life to Agora – and an £8,000 check is supposed to make it all OK. I don’t think so. 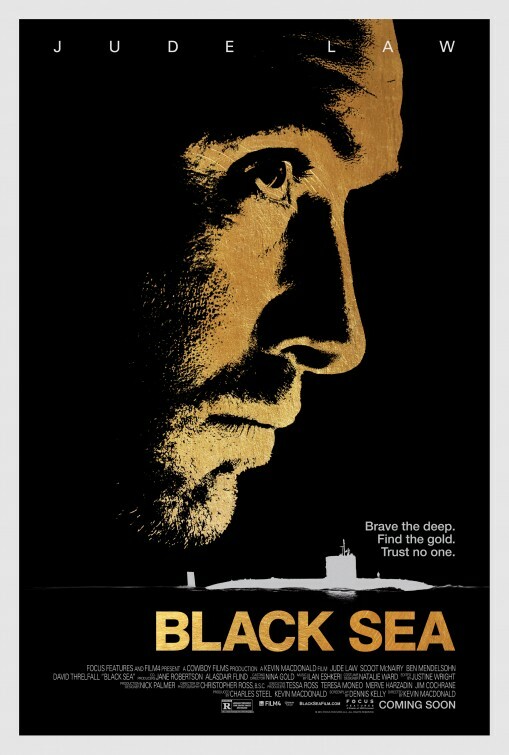 Soon, Law finds out that there’s a sunken Nazi sub at the bottom of the Black Sea, filled with Nazi gold, and before long he assembles an Anglo/American-Russian crew to track it down. This is the best part of the film, as we see the barely contained simmering resentment of all of these men, regardless of provenance, against the superiors who have left them without gainful employment. Plus, director Macdonald (The Last King of Scotland) has populated his movie with excellent characters\ actors, Russian and non-Russian, alike: Konstantin Khabenskiy (Night Watch), Grigoriy Dobrygin (How I Ended This Summer), Michael Smiley (Svengali) and David Threlfall (“Shameless“) among them. Unfortunately, he also miscasts Ben Mendelsohn (The Place Beyond the Pines) and Scoot McNairy (Monsters), two usually fine actors who here do shoddy work in underwritten parts. While the former are part of what works so well in the movie – the wariness and solidarity amongst the downtrodden foot soldiers of the world – the latter are part of what doesn’t work so well in the movie – the submarine heist gone wrong. Is that a plot spoiler? Well, then you just haven’t seen the trailer yet. But don’t get me wrong: I love a good submarine film (Das Boot, anyone?). And some of the scenes of underwater claustrophobia and tension work wonderfully. It’s that when things starts to wrong for the men, they also go wrong with the script. The set-up is fine; the development and resolution are contrived. But as a treatment of the struggle of labor vs. capital, the film works beautifully … until it doesn’t. So enjoy it while you can, and then be glad that it’s less than two hours long.